New Douglas Park is a 6,078 capacity stadium located in Hamilton, Scotland, which is a town in the West-Central Lowlands. Home to Hamilton Academical F.C since it opened in 2001, the club holds the distinction of being the only professional club in Britain to have emanated from a school team. Hamilton Academical relocated to New Douglas Park in 2001 after leaving the original Douglas Park in 1994, forcing the club to groundshare in the interim as they negotiated the sale of the land to Sainsbury’s supermarket and finalised plans for the new stadium which was to be built next door to their original 19th century home. The former Douglas Park’s record attendance of 28,690 was set in 1937 which helps to indicate the size of the old stadium compared to the newer facilities. Currently the record attendance at the all seater stadium is set at 5,898 on the 28th of February 2009 when Hamilton hosted Rangers in the Scottish Premier League, with the small club gaining promotion to the top flight of Scottish football in 2008, seven seasons after moving to the New Douglas Park. As a result of stricter league regulations, the pitch at Douglas was converted back to natural grass after being changed to an artificial composition in 2004 to save costs. At the same time, the South Lanarkshire based club were forced to add a temporary stand during the ground’s inaugural Premier League season in order to satisfy the minimum size requirements of 6,000 seats. 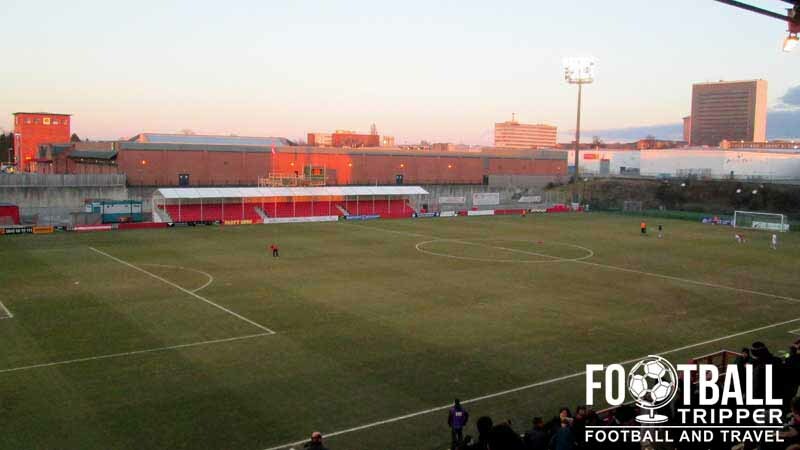 Upon relegation, the club have returned to the artificial playing surface, but the temporary stand appears to be a mainstay of New Douglas Park, existing to this day with an estimated 700 seats for spectators. 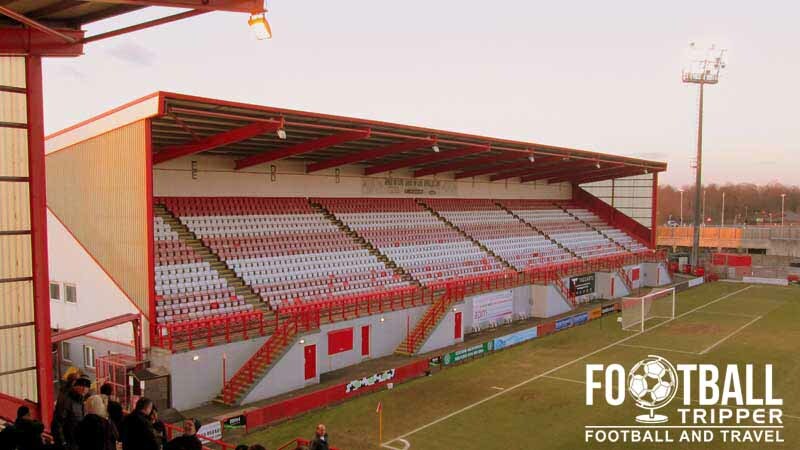 For those looking to connect to the past, the new stadium pays homage to the old Douglas Park by retaining the distinctive floodlights of the former ground. The four floodlights are mounted to steel towers and are located within each corner of the pitch between the stands in most cases. 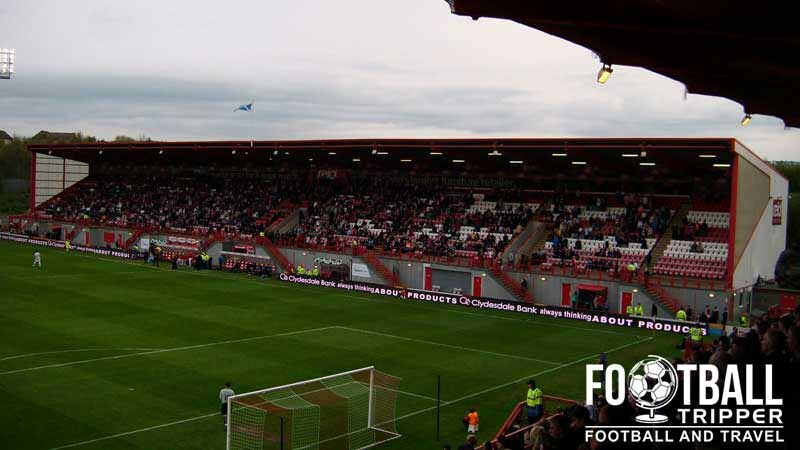 With Hamilton remaining one of the smaller clubs in Scotland, the clubs objective has always been to retain a place in the top-flight and so far this has been the pinnacle of football hosted at Douglas Park. New Douglas Park Stadium is comprised of four stands: North, East, South and West. By default away fans are housed within the North Stand which is currently known as the Spice of Life Stand for reasons of sponsorship. If the demand is expected to be larger or for whatever reason, Hamilton sometimes allocate space to visiting supporters within the East Stand. Located on Hamilton’s Retail Park, the location isn’t the most conducive to boozing although having said that there are three pubs just outside of Hamilton West Railway station. These are the Academical Vaults, The Tap Room, and Bar West on Alamada Street all of which are popular with students of the nearby university. Within Hamilton Central there are plenty of sensible sounding watering holes such as The George and The Stonehouse, with the Hamilton Palace bar & nightclub being the only left-field choice out there. There are two supermarkets (Morrisons and Sainsbury’s) within close proximity to the ground, as well as McDonald’s next to the station which as you can predict is exceptionally popular on matchdays. Between these three places, the food on sale inside the ground, and the handful of independent chippies your food options are pretty much covered. Unfortunately it doesn’t appear as if Hamilton Academical operate a club-shop beyond matchdays, and it also doesn’t appear as if the club have an outlet on the web. This means that if you wish to purchase Accies merchandise then you must attend a match! Outside Hamilton Academical Football Club’s main stand. It doesn’t appear as if Hamilton Academical currently offer fans the chance to tour the facilities at Douglas Park. If the situation ever changes regarding the stadium tour we’ll be the first to update this section. For most Accies matches there is no need to purchase tickets in advance as you can simply pay on the gate, however for high-profile games against Celtic and Rangers the club are likely to temporarily suspend this policy. *Concessions refer to anyone under the age of 18 or over 65. New Douglas Park is located in a very accessible position which is close to the historic town centre of Hamilton, although today it is regarded as being towards the west due to the construction of a newer central station. The gates of New Douglas Park. The club advises that there are a number of free spaces to be had within the car park at South Lankarshire Council on Almada Street next to the University of the West of Scotland campus. 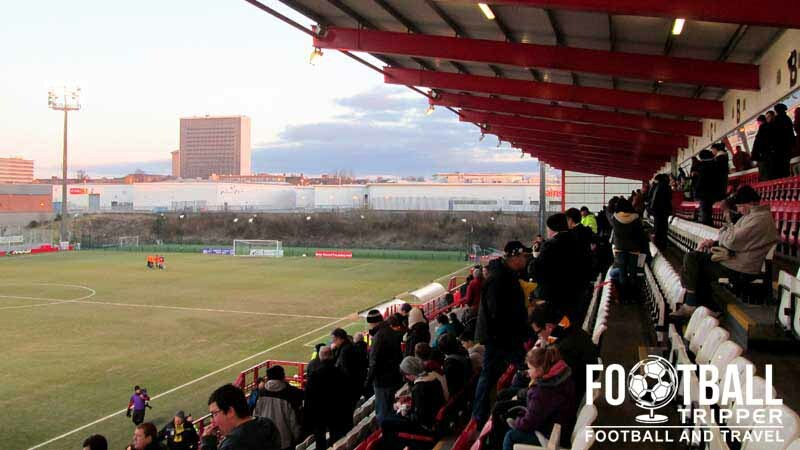 New Douglas Park is located less than two minutes away from Hamilton West Station, with the two sites connected via a convenient walkway which is great on matchdays. Hamilton West Railway Station is the closest to the ground although it is not the main station. The preceding station, Hamilton Central, remains the main station of the town, with frequent First ScotRail services to and from major cities such as Glasgow. The two closest hotels to New Douglas Park are Villa Hotel, and Clydesdale Hotel with the Holiday Inn Express back towards central a popular choice for some fans due to its proximity to M74. As is the Premier Inn north of Hamilton which sits adjacent to the River Clyde.